Today, I am literally bouncing with excitement, as I’m about to show you what I think is one of the best works Party Magic and I have done recently (if not THE BEST). 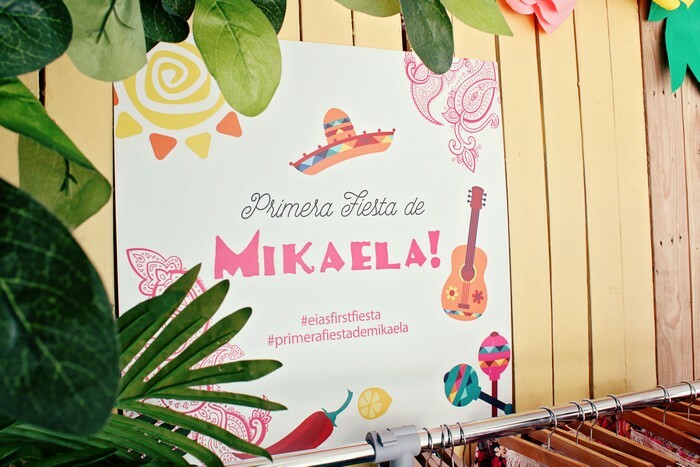 The title of the party is similarly dramatically phrased as well: Primera Fiesta de Mikaela! 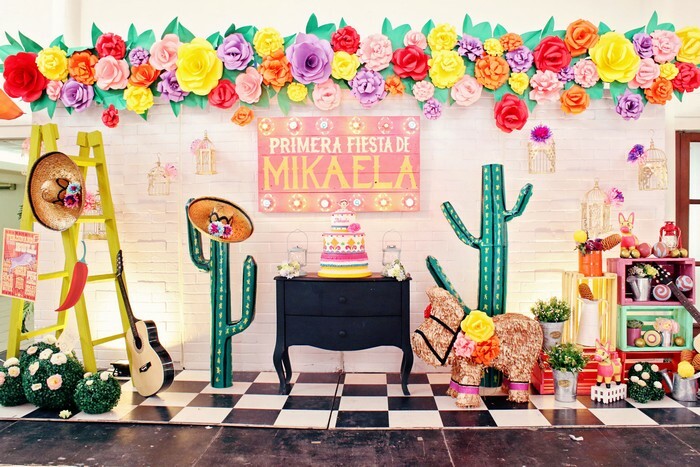 This type of fiesta is not like any other, not only because of the decor, but also because this was the first time I had a client who is an honest-to-goodness public servant! 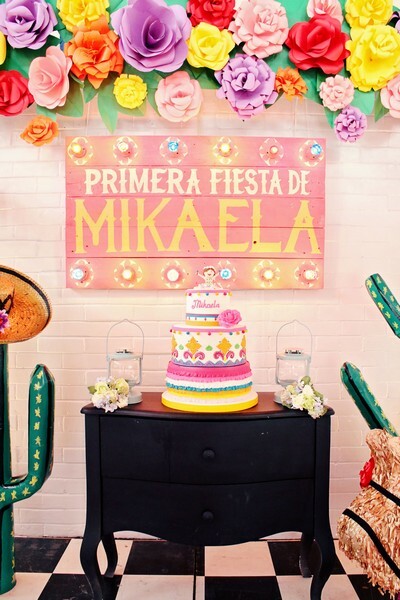 Mayen, who apparently has some Spanish blood, decided it was quite apt to center her daughter’s 1st birthday celebration around this concept of Mexican fiesta. Isn’t this such a visual feast? 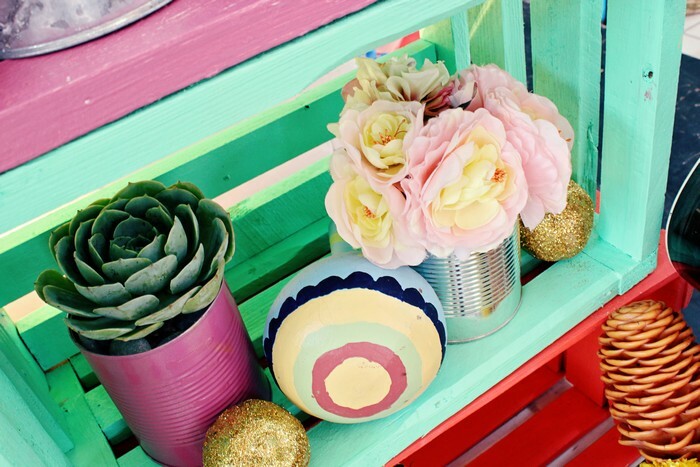 Looking at it feels like being hit by a kaleidoscope of colors. 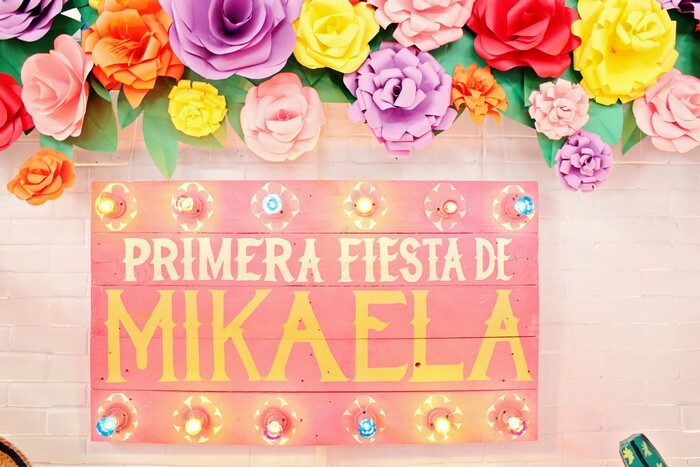 I love this SO MUCH simply because it is NOT the typical definition of a “fiesta party”. In fact, I don’t even think it’s inside anyone’s dictionary. And yet, when you see it, you get it. It’s Mexican. 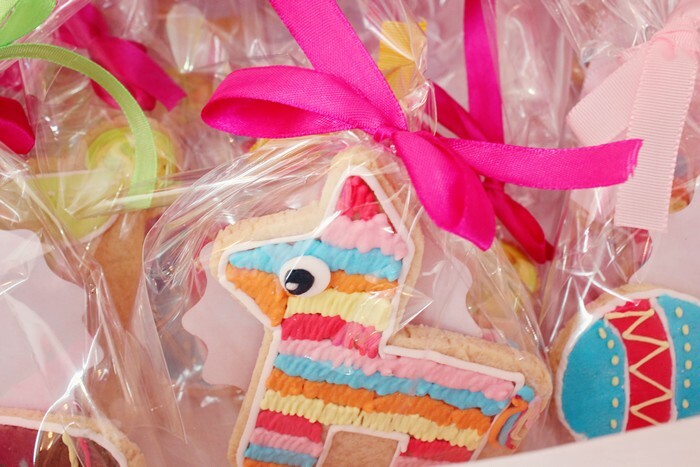 It’s a fiesta. And it’s for a girl. Or, as my husband loves to say, it’s “SOLID!” (pronounced as SOL-leed!). And the details make you curious, makes you want to peer closer. Shall we? Baby donkey (in gold) at 12 o’clock! A flyer about Ferdinand the Bull (seriously, you haven’t heard of him? 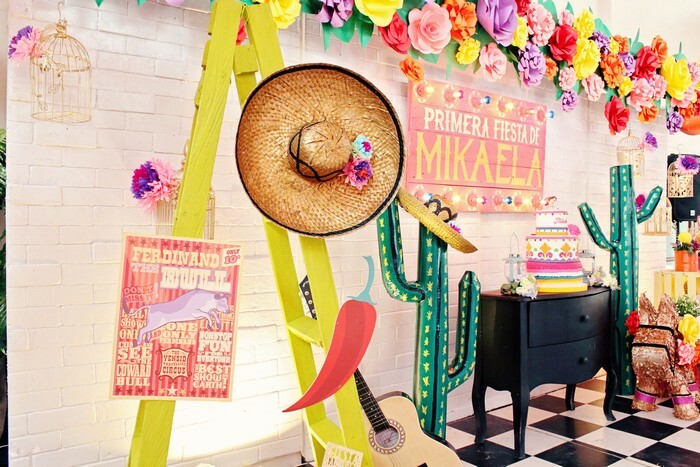 ), an enlarged chili, a flowered sombrero, a vintage ladder painted in screaming yellow-green, golden birdcages, a spanish guitar, and 2 cactuses (or should I say cactii? I get confused!). Isn’t she adorable! 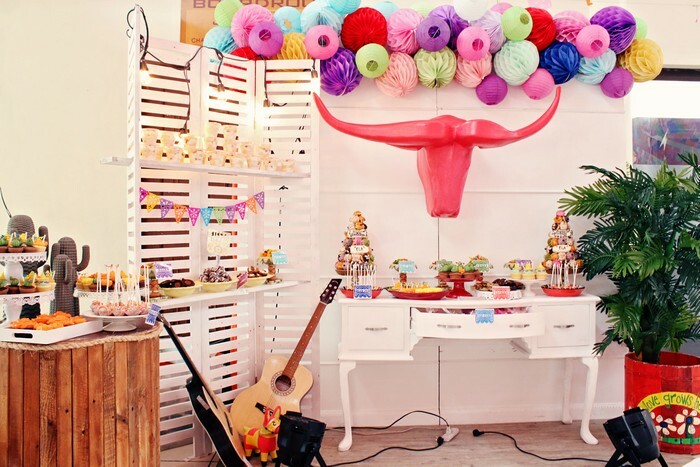 Your own little Mexican entertainer for your fiesta party. Maybe we should call her Conchita? 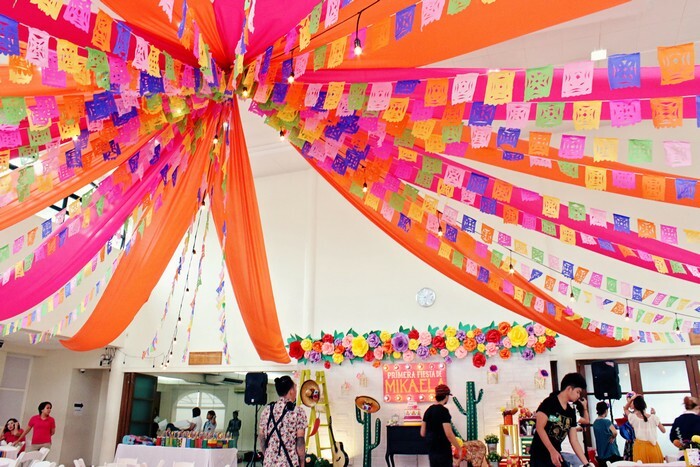 Instead of the usual flavor of lanterns and pompoms, I decided it would be more apt to create hundreds and hundreds of papel picados (a type of perforated paper made usually out of soft tissue paper) for that fiesta theme. Whew, you wouldn’t believe the number of man-hours that went into creating this one! Accenting the papel picados were hanging light bulbs. This is perfect for parties that conclude into the late afternoon, were lighting accents would be more apparent due to the darker surroundings. 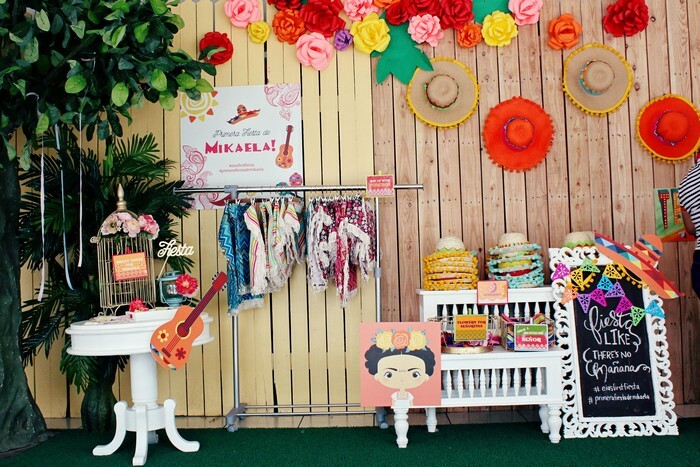 The photo-op we created was a doll. Take a look! Those chairs were a true labor of love – I drew those patterns myself the night before, with the assistance of my little elvish helper, my daughter! Beer, tacos, and salsa! A grown man’s dream come true. 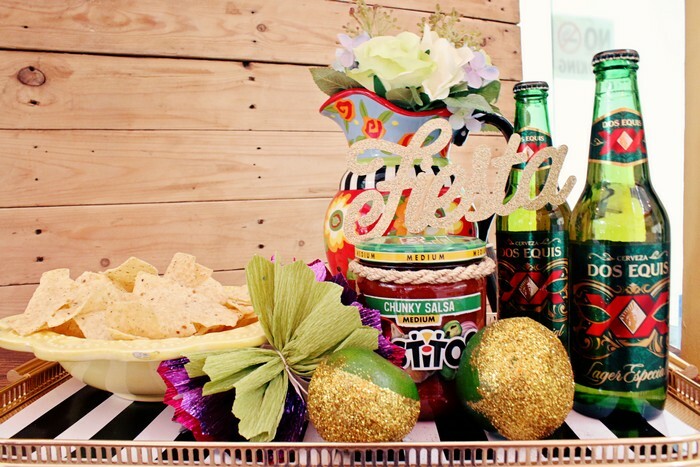 My own goal in creating this highly unusual fiesta party was the insertion of certain key elements into it, such as gold glitter (look at the Fiesta lettering and the gold encrusted fruit in the photo above) that provides the party a more glam feel into it. 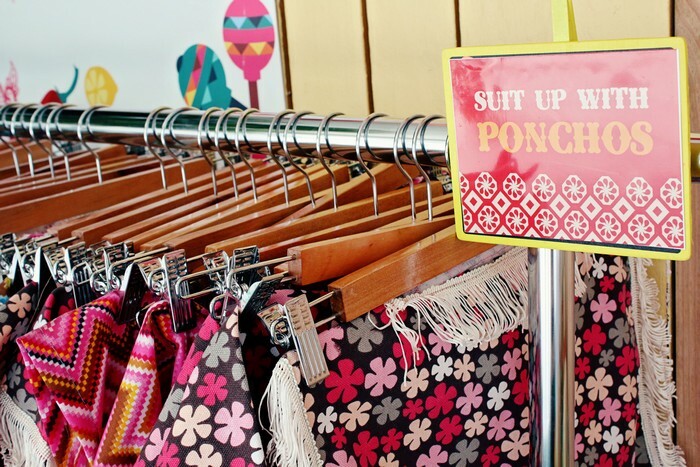 Kind of like a Mexican Glitzy party, or a modern take on the fiesta. 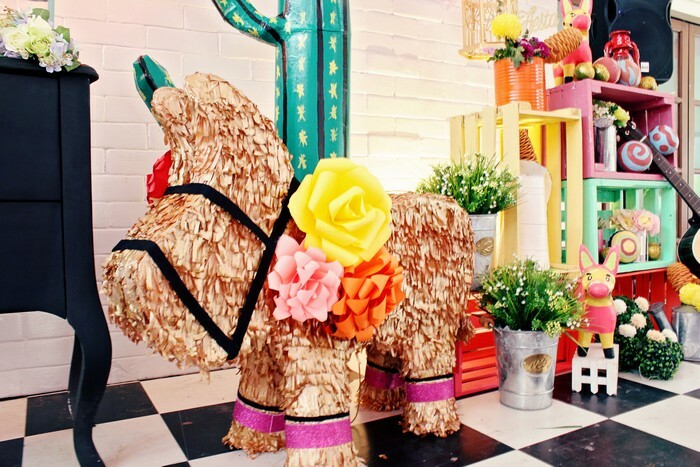 Similarly there is that golden-wrapped donkey and golden birdcages on the stage. Mayen absolutely loved this one. 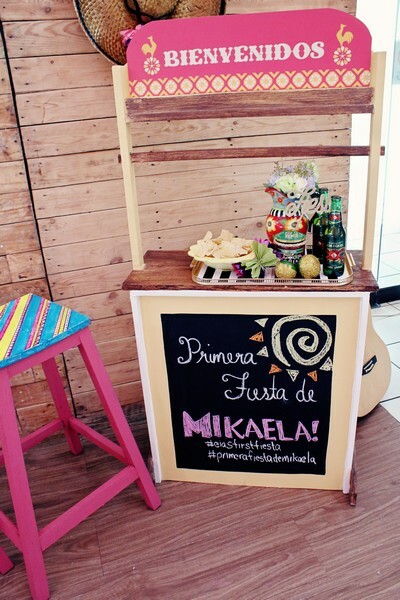 Hand-etched papel picados, but this time customized to her baby girl’s name, Mikaela! I have to confess though, that there is real reason for my enthusiasm for this party. 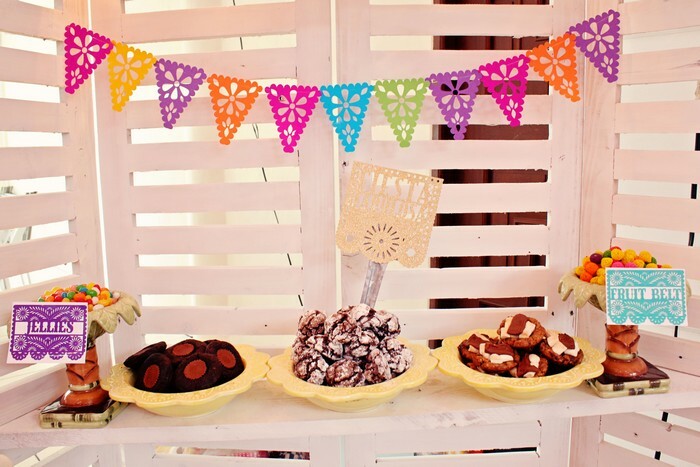 It’s because my husband and I have been talking about great party theme ideas, and one of our favorite ideas revolved around creating a fiesta themed party. 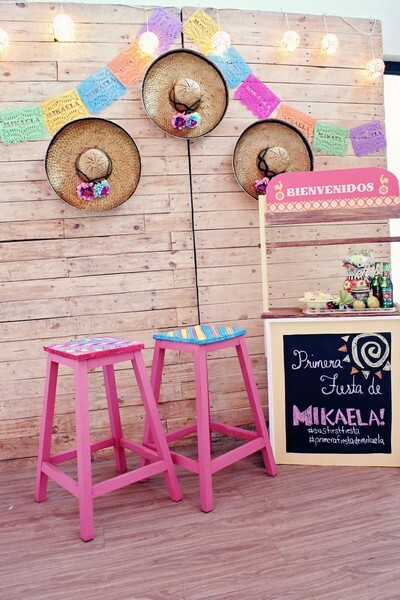 The real appeal to this concept is that you can go all the way with your party, specifically, by offered food with Mexican/Spanish roots. And you don’t have to be limited to just tacos, either. 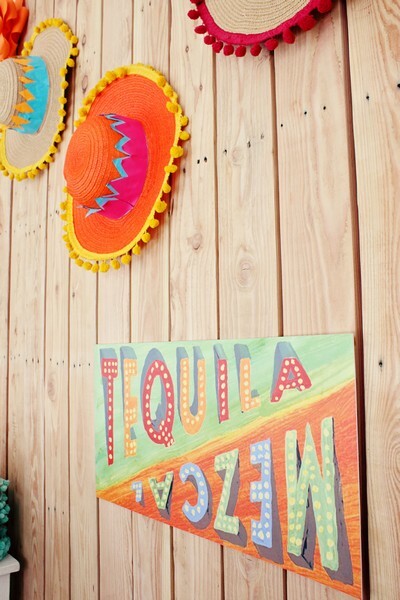 Think paella, gambas, burritos, quesadillas, fajitas, and mojitos for the adults. Oh, and churros! My favorite. 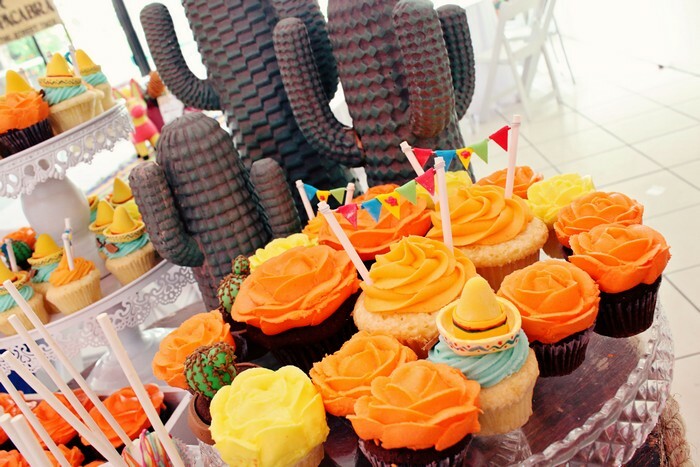 Now, on to my next favorite section of the party – the dessert! 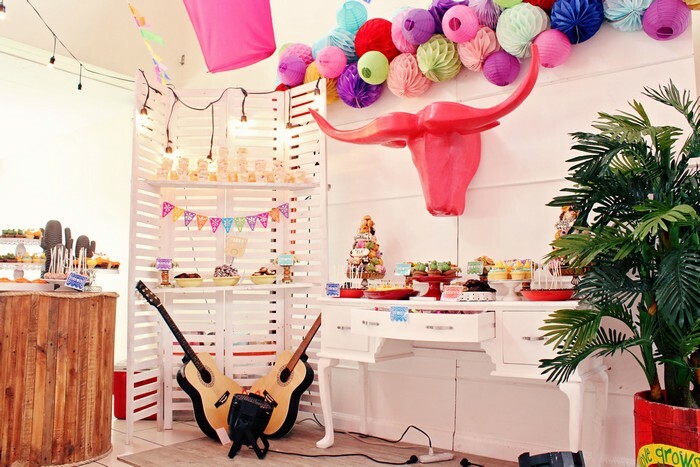 I know what you’re thinking – that bull is absolutely outrageous. Which is why I love it! 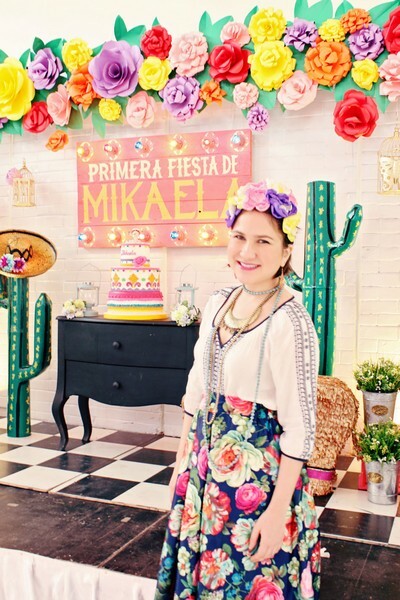 It kind of reminds me of Frida Kahlo, that famous Mexican painter. 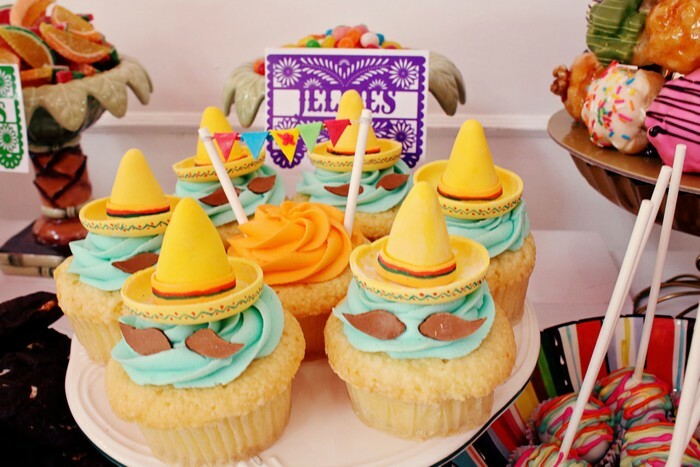 I love these super cute Mexican cupcakes! Nice touch on the moustache and the sombrero! 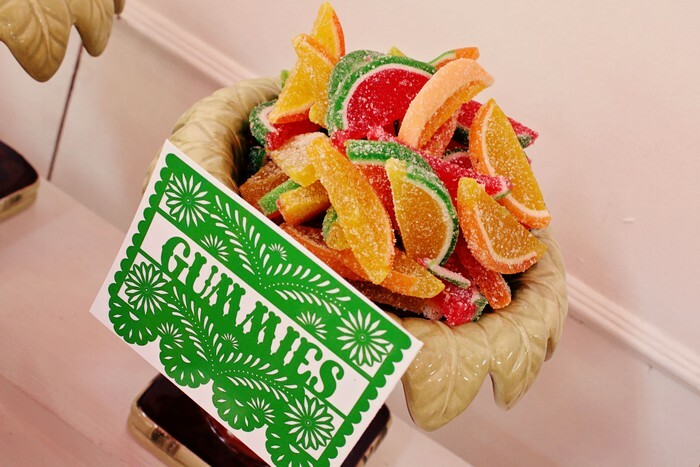 Gummies shaped like fruit slices! 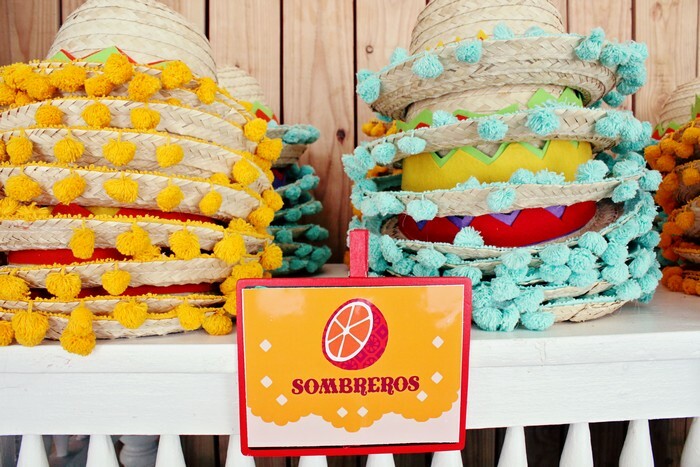 And sombreros for the little ones! So there you go. 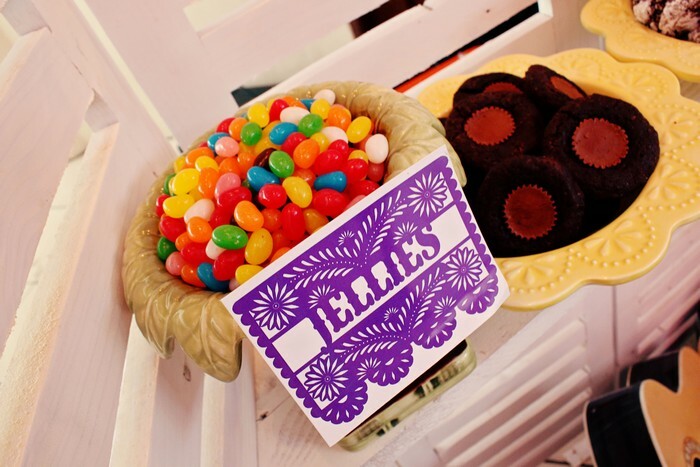 I hope you enjoyed looking at these wonderful photographs as much as I did in making this party. 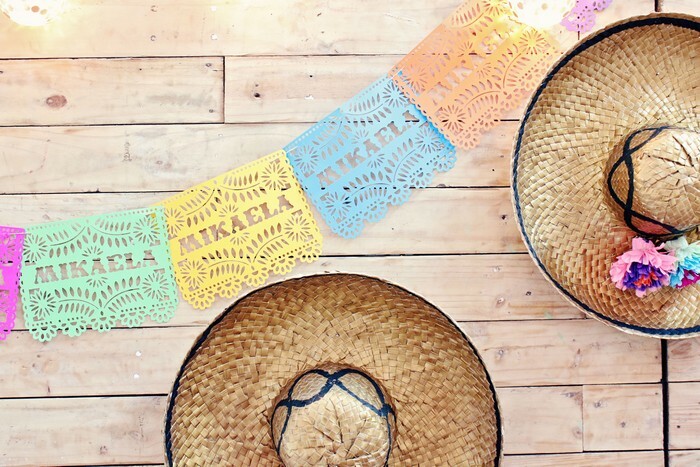 A mostly lovely Mexican Fiesta for our dearest Mikaela!